Winter season is soup season. So far we didn't go much beyond our hearty Ribollita and my husband's all-time favorite creamy leek and potato soup. No adventures into new soup recipes yet this winter! That needed to be changed, for blog's reason. I love quirky ingredients or a combination of those. When I came across a cauliflower apple soup recipe, my curiosity was awakened immediately. 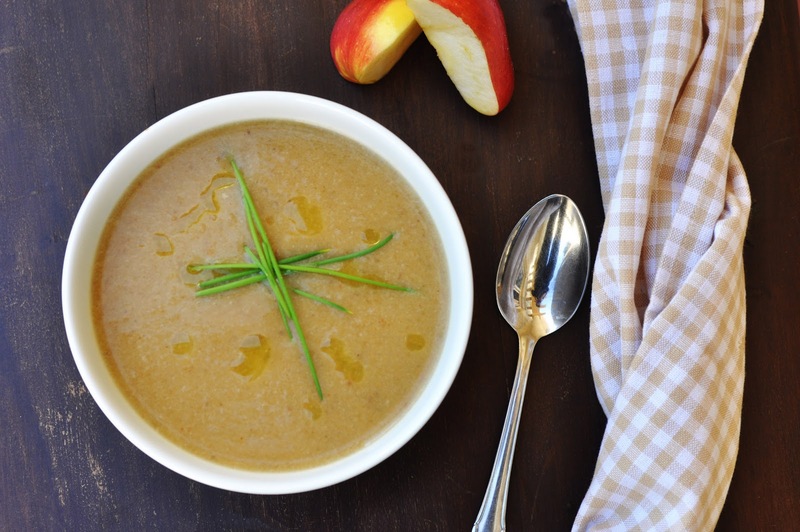 Mild cauliflower, sweet and fruity apples: how would you make that into an exciting soup? Spices. There are many curried soups out there, but I find that the curry often runs over the flavors of the vegetables. In this soup's case, the spices are fresh ginger and garam masala and a tiny bit of chili powder. Just enough to not drown the exquisite flavors of the cauliflower but add enough pungency to make this a lovely winter soup, while the sweetness of the apple remains intact. A lovely soup that is ready in less than 30 minutes. A soup that can be made in advance and keeps well in the fridge for a couple of days. In a large pot, heat the oil over medium heat. Add onions and cook until slightly softened, 3-5 minutes. Stir in fresh ginger, garam masala and chili powder. Cook for another minute. Add clauliflower florets, chopped apples and sweet potato. Pour in vegetable stock. Bring to boil, then simmer for about 15 minutes. Let the soup cool a little. Then blend until smooth and creamy. Season with salt and pepper. Ladle into serving bowls. Garnish with chives. Ready to serve.